‘On the twelfth day of Christmas my true love sent to me…..twelve drummers drumming, etc’. 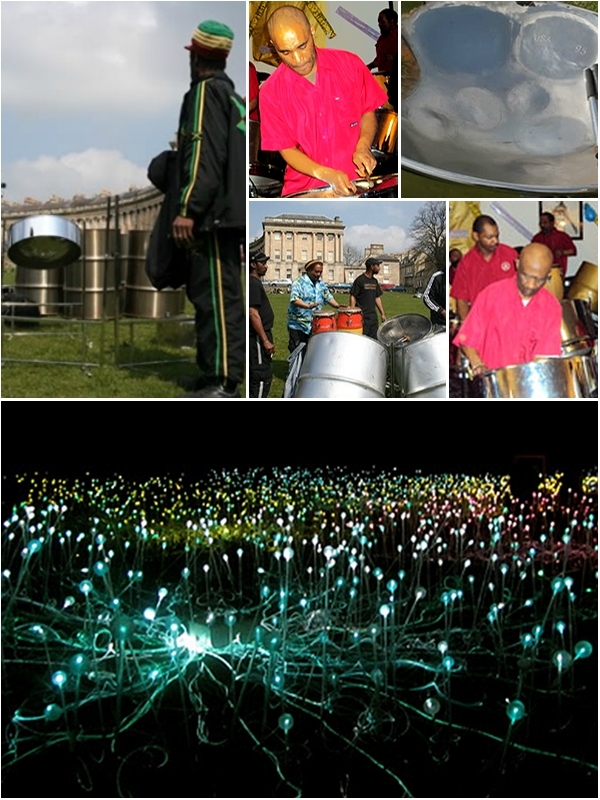 And so it shall come to pass; on Friday, 23rd December, between around 6.00 and 6.30, the irrepressible Rainbow Steel Band will attempt to inject some much-needed rays of balmy Caribbean sunshine into our benighted mid-winter climate by giving a performance in the garden at The Holburne Museum in Bath. The occasion has been organised in conjunction with ITV West Weather, who are celebrating the days of the Festive Season in traditional style with ‘The Twelve Days Of Christmas’ as their central theme, visiting various locations around the West Country and featuring local artists and performers along the way. Twelve Drummers Drumming – it just has to be The Rainbow Steel Band! This happy-go-lucky bunch recently celebrated 50 years of festive music-making, during which time they have been entertaining and delighting audiences all round the local region and beyond with their irresistible mixture of calypso, reggae, ska and soca, interspersed with novel arrangements of popular music given a unique Caribbean twist. The chosen venue is the garden of The Holburne Museum in Bath, and the event coincides with the stunning ‘Field Of Light’ exhibition currently on show. Entrance to the garden is free of charge, so take a break from your last-minute Christmas shopping, stroll over to The Holburne and see if The Rainbow Steel Band can drum up a more cheerful weather forecast – enough said! ’Field Of Light’ meets ‘Island In The Sun’ – a warming dose of Caribbean magic to keep Jack Frost at bay! A boogie-woogie band livens up your wedding celebration.